Again, the reason why the BJP’s defeat in Rajasthan is certain is because Vasundhara Raja Scindia has become unpopular, as have her MLAs. But for all the disenchantment with the local faces, people actually like the BJP and Narendra Modi. If the BJP is all set to lose Rajasthan because its local face has become unpopular, it could retain Madhya Pradesh and Chhattisgarh because the local faces in these two states are still popular. Raman Singh has been the Chhattisgarh CM since 2003 and Shivraj Singh Chouhan has been the Madhya Pradesh CM since 2005. The anti-incumbency sentiment has been piling up in both the states but voters largely don’t target the CMs. They abuse the local BJP, their MLAs, the system, the bureaucracy – but the CMs themselves are not the target of anger. It’s the same with other long-term CMs, be it Nitish Kumar in Bihar or Naveen Patnaik in Odisha or Mamata Banerjee in West Bengal. A popular CM face is the critical X-factor in winning elections but Rahul Gandhi just doesn’t seem to get it. He made Kamal Nath the Madhya Pradesh Congress chief just six months before the election. What is six months to go around mounting a campaign in a large state? Not that Kamal Nath has been declared the CM candidate. “I am not a chief ministerial candidate. I will do whatever Congress president Rahul Gandhi decides,” he told ABP News Monday. Voters will think even if he becomes CM will he be answerable to us, or to Rahul Gandhi? This is how the Congress undermines its own local leaders. The BJP also likes to fight elections in the name of Narendra Modi rather than the local CM face, but at least when the sitting CM is popular, they don’t undermine him. It’s not a Modi but a Raman Singh campaign in Chhattisgarh. It’s not a Modi but a Shivraj Singh Chouhan campaign in Madhya Pradesh. In Karnataka, the Congress cut to size its own sitting CM Siddaramaiah earlier this year. He wasn’t declared CM candidate and Rahul Gandhi’s campaign overshadowed Siddaramaiah, taking away whatever campaign space other leaders had left. It’s a bogus argument that declaring a CM face leads to factionalism in the party. Did the Congress not declare a CM face in Punjab despite factionalism? The dissidents have to be given incentives and disincentives for a united campaign. Not declaring a CM candidate actually increases factionalism because it leads to endless undermining of one leader by another in the party campaign. A CM face could have made the difference between victory and defeat for the Congress in the Gujarat assembly election. 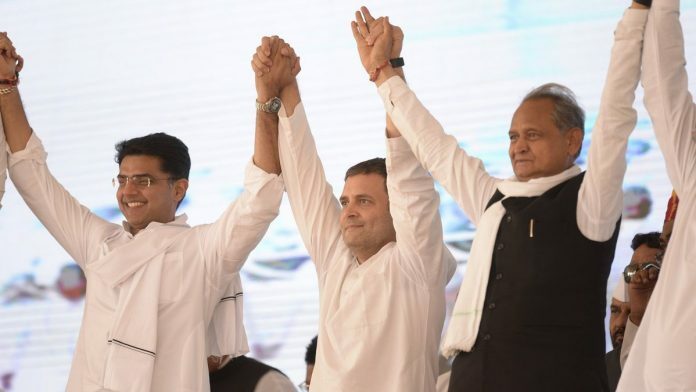 A personality campaign could have made Madhya Pradesh and Chhattisgarh fall into the Congress’ lap. So why doesn’t Rahul Gandhi get it? He doesn’t, because if a state is won in the name of the local leader, how will Rahul Gandhi get any credit? The only state where the Congress party has formed government (on its own) since 2014 is Punjab. Ever heard anyone give credit to Rahul or Sonia Gandhi for that? Credit has gone only to Captain Amarinder Singh and, if any was still left, to the Captain’s private campaign consultant, Prashant Kishor. In fact, it’s no secret that Rahul and Captain haven’t been on the best of terms. Rahul Gandhi was reluctant to declare Captain as the official CM candidate of the party until the fag end of the campaign. If the Congress had used the formula of a CM face with a personality campaign, it would not be losing one election after another. Sure, many elections have been won without a pre-declared CM candidate, but just look at the number of elections that have been lost for the want of one. This is the old problem of the Congress party’s family feudal model – they want every election fought or lost on their name alone. The central reason why they have let the party come down to 44 seats in 2014 elections is because they have undermined their own local leaders. If any election can’t be won in the name of the Nehru-Gandhi family, the Congress, it seems, is happy to lose it. Leaders who claim to be the strongest, like Mrs Gandhi, are often the most insecure. There were tall people around Nehruji in Delhi and the states. She took to creating pygmies. Sanjay Gandhi groomed a clutch of leaders who have sustained the party for decades, including Kamal Nath. Whatever Shri Rahul Gandhi’s fears and insecurities, he lacks his grandmother’s election winning strengths. If the Congress is to revive meaningfully, he needs to allow young colleagues to come into their own. Declaring a leader would not have just beneficial effect as you think. It can also have damaging effect especially where there are contending strong leaders. After all we are in a parliamentary system of democracy where it is left for the elected MLAs to chose their leader. You seem to think you have better sense than Rahul Gandhi as a leader. Why don’t you see the other side rather than arguing what you think as the best. Every person standing for election must affirm under special CODE and in COURT before a MAGISTARATE what he or his office bearers and others in a gang propose to do for the people of this INDIAN STATE. Who will or shall or may vote for him and he or his party is when in power. That the dole handed out will not in effect incur NATION LAND SLIDE of MONEY and NATIONAL debt at the level of the nation building activity and based on probable harsh string and secret commissions and international borrowing poverty and administrative cost crime of interference that goes with it. One cannot give and give and give prefectural doles after dole after dole and sink the working man labor economy in effect to merely gain personal or political power lest it results in growing mob and in human crime and manufacture of caste crimes. Another thing is the caste issue, the person or party shall in its public say shall not communalize the platform. That an a-firm undertaking be by way of rules of business of the GOVERNMENT. That non observation of the moral RULES and code of conduct at the level of the religion + politics shall attract rigorous physical JAIL SENTENCE. Who so ever who in the office of the party or the group or the gang attracts greater JAIL SENTENCE or SENTENCED to HARD LABOUR. That when one caste is at the greater strength and the lesser is at the receiving end it is the office of the state that shall set aside specific rules and functions and roles and purpose in order that the state is a balanced humane state. that poverty resulting from numbers of child 3+ and progeny and wives or more, they the procreators shall be treated to labor or certain deprivation and the state will set up special homes for the all the children and kept away from the family machine and the children shall be educated and inculcated with education and trade engineering and modern technical knowledge. The caste shall be set aside. The idea of classes and masses, and that they will be able to separate the idea of state policy and on the other hand the ills of religious divide and regional politics and divide. The nation be a one gool one go HUMANE NATION. Only that will the nations beyond learn that we are a peaceful and no interfering and trustable nation. Not only we must be engineering and legally NORMAL but we must also APPEAR to be SO and grow. The earlier idea of joining all religious groups has been a sad story. Every person who is elected must under go an entrance to the ADMINISTRIAL ROLE EXAM. His knowledge and passing of test is IMPORTANT to the PEOPLE. One cannot ask a non functional to take power merely by number count it requires a small little more of an IAS.